Andrew Kingston is the 2018-2019 Robert W. Woodruff Fellow at the Rose Library. Throughout the year, he will be blogging about his experience processing the records of The American Music Show. At the Rose Library this year, I have been working with recordings of The American Music Show (TAMS), an Atlanta-based queer variety show that was produced from the early 1980s to the early 2000s. One of my projects was to create a Wikipedia article for this program; while doing so, I encountered many of the problems and the potentials of Wikipedia as an online platform. In this post, then, I’d like to reflect on some of these problems and potentials as they relate to queer communities, and specifically as they relate to the community surrounding TAMS. But before zooming in on the details—if you’ll bear with me here—I will start with a few broader observations about the ways in which communities are structured and represented in general. 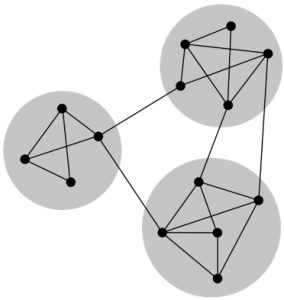 In cybernetics and network theory, a “community structure” is produced within a network when a group of its “nodes” exists in a relationship that is internally more complex than this group’s relationship with the bigger network of which it forms a part. Such structures can occur across all kinds of networks: social networks, digital networks, biological networks, narrative networks, and so on. As a visual example, consider this illustration from Wikipedia itself, which shows three little community structures within a relatively simple network (Figure 1). I’ll return to this concept in a moment. Compared to the diagram here, Wikipedia itself constitutes a similar if inestimably larger network, with significantly more and significantly more complex community structures contained within it. But when considering how actual communities and their structures are depicted by larger networks of knowledge like Wikipedia, we may want avoid thinking about them simply in such diagrammatic or descriptive terms—as if communities were only pre-existing entities or natural systems we can just map out and link to one another in a big encyclopedia. Diagrams, articles, and similar formations of knowledge are both necessary and helpful, no doubt, but they are never purely descriptive. Yes, historical communities often have to first exist before they can then be described and codified in a network of knowledge; but they are also, in other ways, formed and re-formed by the very structures that we might suppose only to represent them. This is to say that changes in the organization of knowledge about a community have the potential alter relations within that community itself. Which implies something of a chicken-or-the-egg dilemma: is a community always formed as such before being described, or is it only through its description that it comes into being? Such paradoxical, philosophy-101-esque chiasmi aren’t easily answerable in the space of a blog post—not even a long one. Instead, what I’d like to do here is to consider the slightly more practical problems that can be derived from this more general one. With this in mind, let’s now consider queer communities on Wikipedia. In “Queering Wikipedia”—a 2015 article from a collection called Queers Online: LGBT Digital Practices in Libraries, Archives, and Museums—authors Rachel Wexelbaum, Katie Herzog, and Lane Rasberry echo the unfortunate observation (initially made by the Wikimedia Foundation itself) that a majority of Wikipedia contributors and editors are “disproportionately male, under 22 years old, and (most likely white and straight) from ‘the Global North’” (“Queering Wikipedia” 62). And this means that, among so many other disenfranchised groups, LGBTQ+ populations have been underrepresented on the most widespread and relied-upon, if not the most trusted, collection of knowledge on the internet. Several consequences can be drawn from this kind of disproportion in representation—one of which would have to do with the supposed neutrality of information on Wikipedia. The project of encyclopedism, in its attempt to encircle knowledge (literally enkyklios-paideia), is commonly assumed to present relatively neutral reflections of the world. Indeed, one of Wikipedia’s own pseudo-religious “five pillars” emphasizes such a neutrality: “Wikipedia is written from a neutral point of view.” However, such a “neutral point of view” can only be applied to the content that is already present on Wikipedia at any given point, and Wikipedia will therefore have a harder time remaining neutral with regard to what remains absent from it. In fact, to the degree that (1) a disproportionate chunk of knowledge is missing within a supposedly neutral collection of knowledge like Wikipedia, and (2) to the degree that this collection of knowledge is implicitly presented as an accurate reflection of reality, such absences can never be neutral. This is because, firstly, these absences are often not legible in the first place, and they therefore cannot be simply understood as potential pieces of knowledge that are merely missing; rather, the fact that their absence is itself unreadable within such an expansive platform as Wikipedia suggests that they have gone unrecognized as potentially valid sources of knowledge to begin with. Admittedly, Wikipedia does have so-called “red links,” which serve as placeholders for potential articles that do not yet exist, and this definitely helps to rectify the problem. But this solution only goes so far, since of course red links will also have to be inserted by Wikipedia editors. And if there are fewer Wikipedia editors who are prone to actually create them for particular groups or communities, then these links alone cannot fully address this problem. However, as the authors of “Queering Wikipedia” observe, the Wikimedia Foundation has acknowledged this predicament, and has actively attempted to recruit new “contributors and editors from a variety of communities” since at least 2011 (ibid.). One strategy for doing so has been to organize so-called “Wikipedia parties” or “edit-a-thons” (which Emory also has begun to do), in which groups of people come together to educate one another about Wikipedia, and to create and edit articles together. Early and peculiarly queer adopters of these social events, like the Tom of Finland Foundation, had some success in increasing LGBTQ+ subject representation on Wikipedia, as well as attracting future editors (“Queering Wikipedia” 64-65). Additionally, a now-popular project called Wikiproject LGBT Studies continues to actively develop LGBTQ+ content. And, further, since 2012 representatives from “Wikimedia LGBT” “have presented and facilitated discussions at the annual Wikimania conferences, the Wikimedia Diversity Conference in Berlin in 2013, and the annual WikiCon USA Conferences” (“Queering Wikipedia 67). In these ways, then, various groups have been actively working to augment the amount of LGBTQ+ content represented on Wikipedia, as well as the number of LGBTQ+ Wiki editors. But there is a second sense in which a lack of queer Wikipedia editors and articles is not just a simple, neutral absence. Not only does such a lack have an effect on all the potential information that remains missing from this public archive; it also affects the information that is already there. And this will return us to the question of “community structures.” Considered as a network, Wikipedia forms its complex community structures through functions like “hyperlinks” and “categories.” Adding these links and categories are in fact required by Wikipedia in order to create a successful article. I’ll briefly explain how this works. On one level, Wikipedia articles are joined together under categories that group them based on their content. For example, there are many LGBT[Q+] categories, like “Gay Bathhouses in Canada,” “Queer anarchism,” “Homosexuality-related media,” and “LGBT and suicide.” On another level, groups of historically or theoretically related subjects will also be joined with one another somewhat more directly by way of the hyperlinks embedded within their articles. To give a quick example of this, one could imagine a certain community structure (among many others) that would be formed between the Wikipedia pages for San Diego, Atlanta, and New York City, according to which these cities would be linked via their intersection on RuPaul’s page. At first, perhaps, relationships like these might not seem to offer much more than interesting Venn diagrams, or the answers to Jeopardy! questions. But at the same time, these seemingly abstract community structures also provide possibilities for real communities to come together in new and different ways. In this sense, new articles and pieces of information on Wikipedia serve not only to contextualize and to describe sets of facts; they also re-orient the ways in which particular and already existing pieces of information are received and perceived by readers, and especially readers within specific communities. In this way, Wikipedia’s hyperlinks can help to form new pathways for the flow of information. New community structures thus emerge on this platform not only through the presentation of new subjects, but also through the reorientation of existing information. The American Music Show and the people and organizations surrounding it are certainly notable enough, having made significant and indelible impacts on at least Atlanta’s arts and queer scenes. TAMS has been off the air for about 14 years now, and many of its recordings are finally about to be digitally preserved in Emory’s Rose Library (in fact, they are all being digitized at this moment). However, it will be just as important to preserve the memory of this show and this moment in queer Southern history in more public forms of memory like Wikipedia. Doing this will have several benefits. First, as I’ve said, it will lead to the formation of new “community structures” within the existing networks of articles on Wikipedia—particularly in relation to LGBTQ+ topics. But, as I’ve also been suggesting, these abstract community structures are never just abstract, and they can have very concrete effects on the communities that they represent. By linking The American Music Show to other parts of Wikipedia, members of various LGBTQ+ communities both inside and outside of the city of Atlanta will be more readily able to familiarize themselves with the richness of this show’s history and how it could relate to other areas of culture with which they already interact. Moreover, the memory of this show has the potential even to alter how some people might interact with physical spaces around the Atlanta area: consider, for example, how this video, which explores the old cruising trails of Piedmont Park, might mentally reorient a person’s relationship to Midtown—even if that person was not around to know about or experience the trails for themselves. We would lose an abundance of such potentially enriching relationships to the world, and to one another, if we were to forget these queer histories.